TJ and Allegra were on the flight so that was a bonus. Al, Sandy, POJ, and Linda were already in Jacksonville and had been to the expo. They texted to see if we wanted them to get us some tickets to the pasta dinner and we, of course, said YES! 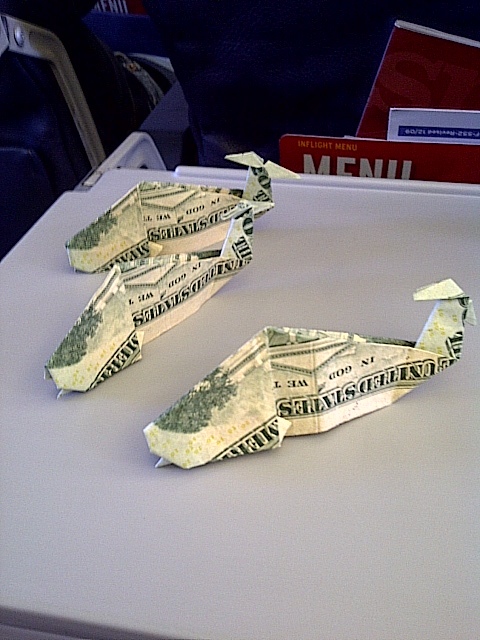 We owed Al $20 each for the tickets so we used up some free time on the plane to make origami whales out of twenty dollar bills (which he promptly unfolded and stuffed in his wallet). TJ and I struggled mightily with the intricate folds required. Allegra was very patient with us and jumped in to make the harder folds when necessary. Looking at the weather forecast as race day approached it was hard not to get excited. It was looking darn good. After travelling hither and yon in search of perfect conditions it was a little surprising that Florida might actually deliver (after striking out in places like Utah, New Mexico, Northern California, Pennsylvania, etc…). Waking up race morning to discover that the actual conditions were a little better than the forecast made it even better! The timeline was going to be pretty tight. The race started at 7:30 am. I allotted 4 hours to finish. 30 minutes to collect myself, get my drop bag, and pound some coca-cola. The shuttle ride from the finish line to the hotel would add another 30 minutes. A quick shower, packing, and checking out would tack on another 45 minutes. Another 30 minute segment to get to the airport and drop the rental car. If everything went according to plan we’d be at the airport at 1:45 pm for a 3:25 pm flight (and if we were lucky…have enough time to eat/drink/be merry). Adding a layer of urgency was our desire to be in line to board the plane on time so as to secure some exit row seats with extra leg room…always good when you just ran 26 miles and those pesky final 385 yards. So, with good weather and a tight timeline to adhere to we were off to the starting line. We got an early start. I woke up at 4:45 am to catch the 5:15 shuttle to the starting line 30 minutes away. I didn’t mind shivering in the cold for an hour and a half (yes, the shuttle left a little late)…I figured I was lowering my core temperature and that would come in handy once the mercury started rising. According to the race director’s husband, who is also a local meteorologist (aka weather man), the temperature would climb around 5 degrees per hour. That meant our 40 degree start time would yield to roughly 60 degrees by the time I finished. Not perfect but not too shabby. Plan? I didn’t really have a plan. I’ve put on about 10 lbs since St. George in October and I don’t feel like my training since that time has been all that it can be so I knew Boston was not in the equation. I thought if the weather could hold I might have a shot at a PR but wasn’t certain that was really doable either. I decided just to go out and run effortlessly for a few miles and see where that put me and, from there, I would devise a goal on the fly. No garmin, no pacetat, no pace band…just me and my timex clipping off miles. Miles 1 – 5: I was running at an 8:19 pace without really breathing hard and with no perceived exertion. A PR just might be in the cards. This part of the course takes you over a long, tall overpass from the starting line at the Mayo Clinic to the beach. Long, tall overpasses are not a big deal at mile one of a race…unless the race is an “out and back” and that overpass is also at mile 24. But I digress. Miles 6 – 10: I covered these at an 8:45 pace including a 9:25 mile 8 were I hit the porta-potty for what turned out to be a one minute stop (yes, I timed it). A couple of the miles were on the beach which was kinda cool. The slope to the water was very slight, the breeze coming off the ocean was very nice, and the sand was very well packed. I give that section a thumbs up for uniqueness! Another cool bonus of this section was running with Bill Rodgers for about a mile. Miles 11 – 15: I clock my first true mile over 9 minutes at mile 13. It surprised me a little since the couple of miles before and the couple of miles after were all in the 8:40s. The average for all 5 was 8:56. I was still running with what seemed like very little effort. This section was run mainly through some neighborhoods that were off the beach. There were lots and lots of people, mainly kids, handing out oranges and bananas. I took both from most. It was getting close to 9:00 am and I was getting hungry! Miles 16 – 20: There will be no more miles in the 8s. The fastest mile in this section is a 9:06 @ 17 and I clip 10 @ 20. I thought taking it easy early would save me some energy for later but, for the second time in as many attempts, that just wasn’t the case. By this point I’ve eaten a GU, a half of a Snickers Bar, several orange slices, a banana, and a bite sized Luna Bar that was in the race packet. Even with all of that and the reasonable temperature I am running on fumes. Allegra catches me at 19 and I run with her for about 50 feet before figuring out that she’s too strong. Within a mile I can’t even see her anymore…and that section of the course is long and straight! Miles 20 – 26.2: Mile 21 will be my last mile under 10. After 23 I wouldn’t be able to get under 11…and that includes the nice downhill after the return climb up the overpass. Oddly enough, the finish line came up quicker than I thought it would. I vividly recall seeing the scaffold in the distance and thinking it was more of a gateway leading to the finish line. My surprise gave way to relief as my quads and calves had had enough of the monotonous lack of terrain change. I was officially toast and happy to be finished in 4:05:49. After the shuttle bus ride from hell back to the hotel…we adhered to the timeline pretty well and managed to make it to the airport, claim our exit row seats, and were back in Austin by 6:15 pm. I consumed several Coronas on the flight back to assist with cramping and recovery. I tried to pay for each one but the flight attendant would not accept my payment. I felt like a semi-famous country music star! 22nd marathon. 12th state. 12th fastest time. Shamrock Marathon in Virginia Beach, VA on March 20th is next. It’s sponsored by a beer company so how bad can it be?? After peeling off a string of 7 sub 4 hour marathons I’ve now got a string of 3 that are over 4. They are trending down though (4:38, 4:06, 4:05). I plan to start making progress towards my ultimate goal of qualifying for Boston again at Shamrock. It’s only 5 weeks away but that’s enough to get started.